In the annuals of American journalism, few moments are more seminal and status-quo shattering than Diamond Reynold’s live report of a police shooting on July 6. She deserves the Pulitzer Prize. Based on Diamond’s account, and public information later confirming her statements, an unnamed cop from the St. Anthony Police Department pulled over the vehicle in Falcon Heights, Minn. She was a passenger, along with her four-year old daughter. Her 32 year-old boyfriend, Philando Castile, was the driver. Allegedly, Philando told the officer that he had a license to carry a concealed weapon and reached as instructed for driver’s license. The cop let loose a barrage of bullets. Diamond started broadcasting live from her Facebook page seconds later. As Diamond’s calm, cool narration begins, the officer’s gun is visibly pointed inside the vehicle, as Philando slumps and blood soaks into his white T-Shirt. It is a horrific moment of violence broadcast live for 10 excruciating minutes. Even after she and her girl are removed from the car and placed in a police vehicle, Diamond continues to stream, addressing anyone watching on Facebook. Videos—captured by compact digital cameras and cell phones—tell the story of unrest that only quieted today. Example: This 40-second video of young woman, Neda Soltan, dying…The video is raw and unfiltered. It’s the kind of footage that only a few years ago professional news organizations could capture and broadcast—and there would have been tight control over when and how it was broadcast and copyrights against redistribution. Now, people can self-broadcast to YouTube. Diamond’s wrenching video is by no means the first showing police violence against African Americans. Two qualities set hers apart from, and raise it above, the others: Live, real-time broadcast; her explaining—reporting—events as they unfold. But Reynolds’ live video was different. Not just a documentation of what happened, it was also a real-time cry for help. Unable to call the authorities as she watched her loved one slip away, Reynolds instead called on the public. How astute; wish I was the author (way to go, Issie). Facebook Live made its debate to a select few last summer, expanding to iPhone users in January 2016. Three months later, FB broadened availability. The point: Live is a fairly new service, for which awareness and adoption may still be limited. But the tagline, in context of other recent news media services, reveals Facebook’s ambitions (and those of users): “Broadcast to the largest audience in the world with the camera in your pocket”. 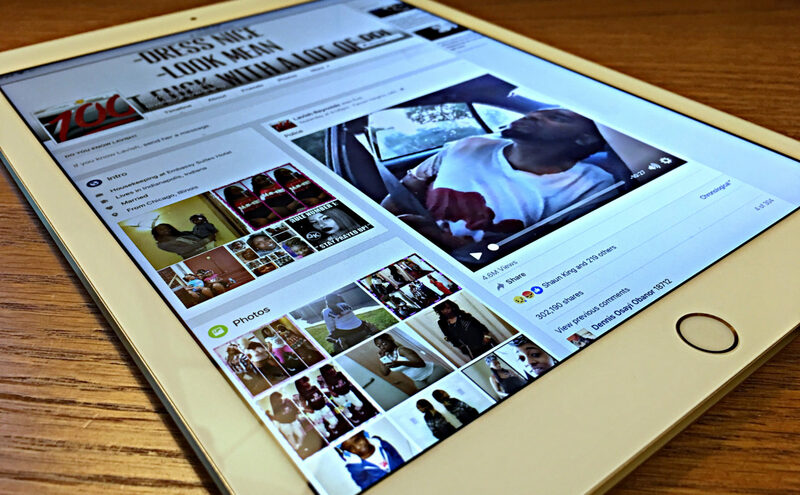 As I publish, Diamond’s graphic video has about 4.5 million views. I predict that her live broadcast will do more to spark awareness and public debate about black racial profiling than any other recent police shooting, or video documentation about it. Already, Minnesota’s governor admits: “This kind of racism exists”. The video would have marginal meaning, if not for her reporting events like a journalist is trained to—or the rage she later lets loose like a professional would resist doing. Among several evolving 21st Century news gathering styles is something called “immersive journalism“. Vice News is a practicer, seeking to make the audience feel like part of the story. The video content is original in the sense it’s exclusive—bringing the viewer right into the story—and packs originality into the documentarian, being-there style that presents a point of view. Immersive journalism in video is raw and real, which certainly describes Diamond’s Facebook Live broadcast. She may set more than a fire under the already simmering debate about institutional racism but one under Facebook Live—and adoption as a transforming news broadcast tool. By the masses. I predicted years ago that smart editors would transform their newsrooms from reporting to authenticating, curating, and editing audio, photos, text, and vids from citizens—local and global audiences. Participatory journalism is where the audience and news organizations meet. If you strip back journalism to its core, one thing remains: To serve the public interest. Last night’s Facebook Live broadcast meets that standard. Handily. Now, please, let’s put Diamond Reynolds on the fast-track for a Pulitzer.